Whether you are fighting street gangs, managing a virus or fighting back the undead, the Elhiem range of useful figures will delight you. 20mm Modern Elhiem x2 Male Body Guards in suits and shades/Secret Service etc. Ladies in suits and a..
20mm Modern Horror Elhiem x3 Male Survivour/Insurgents armed with AKM. Civilians males (west) with A..
20mm Modern Elhiem x2 Special Investigation Team in armoured vests, knee pads pistols drawn. 1 has t..
20mm Modern Horror Elhiem x3 Survivor group 10: Civilian Authorities Planners 5 includes Researcher,..
20mm Modern Horror Elhiem x3 Civilian Authorities Planners 3 - Dispatcher, troubleshooter, operation..
20mm Modern Horror Elhiem x4 Survivor group 9: Civilian Authorities Planners 4 includes Virologist, ..
20mm Modern Horror Elhiem x7 civillians with a mix of weapons 4 male and 3 female figures armed with..
20mm Modern Horror Elhiem x5 Survivour group 8: Civilian Authorities Planners including Field Direct..
20mm Modern Horror Elhiem x4 Bikers with a mix of Assault Rifles, SMG and Shotgun..
20mm Modern Horror Elhiem x4 Survivors includes 3 female and 1 male group have banded together. 1 fe..
20mm Modern Horror Elhiem x5 Goths/punks 3 males and 2 females equipped with mix of weapons (chainsa..
20mm Modern Horror Elhiem x4 Survivors includes 1 male with cowboy hat and AKM, 1 male in casual clo..
20mm Modern Horror Elhiem x4 Survivour group 5 Hillbillies includes 2 males with with hunting rifles..
20mm Modern Horror Elhiem x4 Survivour group 6 Preppers includes a mix of civillian and military sur..
20mm Modern Horror Elhiem x4 Survivour group 7: Lawmen includes a mix of modern Western (western hat..
20mm Modern Horror Elhiem x4 Survivour group 8: Civilian Authorities Planners includes An Epidemiolo..
20mm Modern Horror Elhiem x2 Survivour group 9: Heavy Team includes 2x EOD suited guys armed with a ..
20mm Modern Horror Elhiem x4 Survivour/Insurgents armed with M61A1 and M61A2..
20mm Modern Horror Elhiem x2 Survivours carrying boxes. 2x men carrying crates, food? weapons? meds?.. 20mm Modern Horror Elhiem x2 Survivours/Insurgent/Criminal armed with automatic pistols..
20mm Modern Horror Elhiem x2 Survivours/Insurgent/Criminal armed with ShotgunsCivilian guys armed wi..
20mm Modern Horror Elhiem x2 Survivours/Insurgent/Criminal SPIES/ Secret Agents with TEC9 SMG..
20mm Modern Horror Elhiem x6 Mounted Survivours/PostApoc/western insurgent Cavalry. 6x men and horse..
20mm Modern Elhiem x5 SWAT Team (could be special forces) equipped with various weapons (MP5, M4, M1..
20mm Modern Elhiem x3 US Cops w/ Peaked Caps. 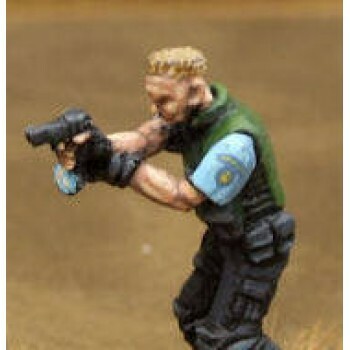 This set was commissioned by Joe of Dicehead Games..
20mm Modern Elhiem x3 US Police Standard Uniform in short sleeve and long sleeve shirts, no hats in ..